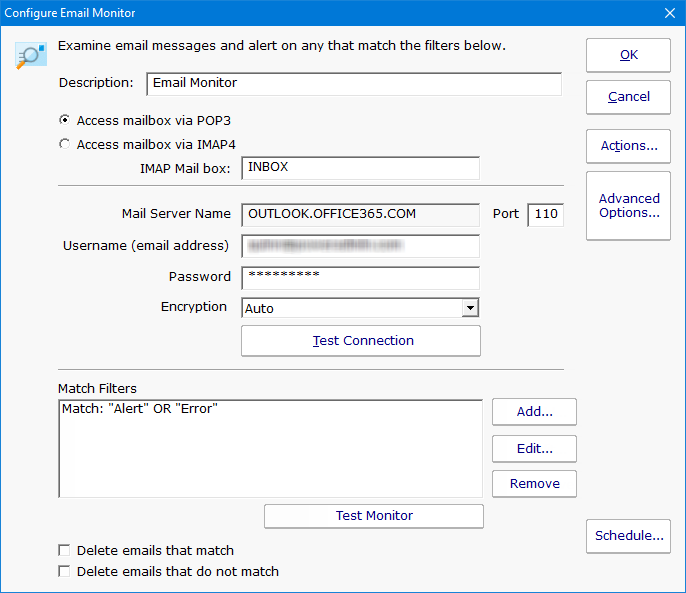 The Email Monitor can connect to a POP3 or IMAP4 mailbox and scan for messages that match criteria you choose. This could be used to monitor devices that can only send email alerts, or as part of an email loop monitor verify email sending is working. Above you can see the configuration dialog for configuring the Email Monitor. The Mail Server Name is taken from the server that the monitor is attached to. Mail server type (POP3 or IMAP4), username, password, port and encryption settings can be set. To be able to monitor Gmail accounts a security setting change is needed. The most powerful part are the filters. Here you can specify what needs to match in order for the actions on monitor to fire. The matching text should be placed in quotes. 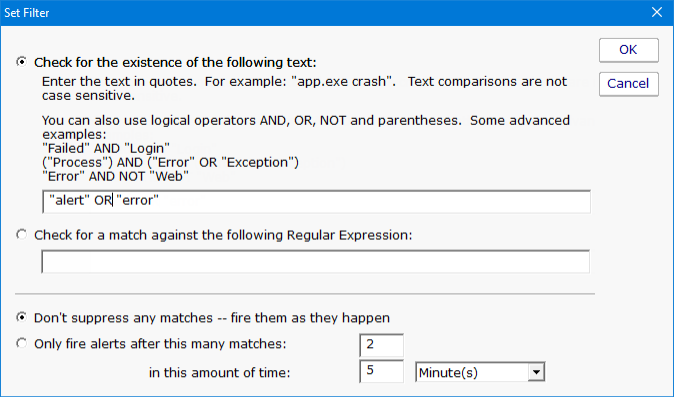 You can use parentheses, and AND, OR and NOT logical operators. In addition, a regular expression can be used. The filter is run against the email message body, and also the subject. If a filter matches either one, actions are fired. At the bottom of the main configuration dialog are instructions about what should be done with messages after they are scanned. They can be deleted if they match, and/or deleted if they don't match. We recommend using a special mailbox for this monitor, and then delete all messages whether they match or not to keep the mailbox size small, and to prevent messages from being scanned multiple times.